Long gone are the days of portrait studio photos year after year, the same stale poses of mother and father surrounding their seated children. Photography has become such a popular amateur vocation that many capable people are offering their services – so it’s not hard to find a good photographer. Take to Facebook and research local photographers. Ask friends for recommendations and be sure to read any potential photographer’s reviews. While you’re looking into the perfect photographer, check their online portfolio and pay attention to their prices. Photographers tend to take pictures as a side-job so their schedules are limited. When you do settle on a photographer, be sure to schedule your session as soon as you can. Use the time until that date to have a discussion with the photographer about location and any pose ideas you may have. Since portrait studios have decreased in popularity, it only makes sense that photos are now being taken outside. Not only is there an undeniable appeal to being outside, but photo sessions outside gives the you and the photographer a wider range of poses and atmosphere. Autumn is such a beautiful time of the year – gold and crimson leaves, crisp air, apples, pumpkins…there’s so much to work with in the fall. When choosing a location, consider areas such as trails, apple orchards, pumpkin patches or a public property with an old barn. Ask your photographer for input on this as well – they likely have lots of experience photographing around your areas and may know of some amazing hidden gems! I can’t say I ever fell victim to the white-t-shirt-and-jeans trend that once swept the world of family photography. Thankfully, those days are gone. The general consensus nowadays is for parents to stick to neutral colours while dressing their children in more colourful threads. Oh, and avoid crazy patterns. Because it is a cooler time of year, you’ll likely want to wear warm and comfortable clothes. Try to coordinate with the season by sticking with warm colours such as shades of orange, red and yellow as well as smooth purples and deep teals. In doing your family portrait research, I would suggest visiting a site such as Pinterest for inspiration. Simply search for outdoor family photos for ideas on posing as well as props. Some great poses include having your family run, hug and play. You could bring a warm blanket and have some shots done while laying down. A cute idea would be to have your little ones cover their eyes while you and your partner kiss! As far as props are concerned, you want to stay away from things that look out of place outside unless it is an item with significant meaning. Otherwise, try to get your hands on haybales, ladders or pumpkins for a real Autumn experience. And don’t forget about leaves! Imagine the shot your photographer can get after throwing leaves in the air. Kids are amazingly patient creatures. Okay, I couldn’t even keep a straight face typing that. 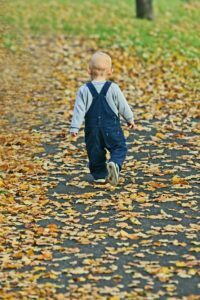 Depending on the scheduled length of your session, your little ones may not be as cooperative as you hope they will be. 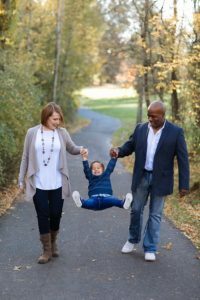 Be sure to give them breaks if the session is long or if they are getting squirrely – and, who knows what kind of candid shots your photographer might sneak while your kids take a breather! Younger children should definitely be fed beforehand and photograph session should be booked around their nap times. Basically, you want to make sure the pictures are being done during your child’s optimal time of day. Generate excitement for your little ones by getting them involved in choosing props and poses!